Growing up, Ann Snell heard a lot about Indigenous life and culture, particularly around the dinner table. Her father, an architect, was interested in simplifying living to complement the human condition (which he referred to as "treading lightly on the earth"). So when she had graduated with her fine arts degree and was offered the opportunity to visit two Indigenous communities she jumped at the chance. Meeting Aboriginal artists for the first time, Ann says she was struck by the balance of ego and talent, "Some of these artists were already renowned but they were so humble - it was really refreshing...it felt true." For the first time, Ann felt in a privileged place, having the freedom and opportunity of being able to provide many of them their first Sydney reveal. "The way the artworks were presented at the time was not very formal," she says. "Major pieces were on the wall but a whole lot of works by emerging artists were in a bargain-bin. 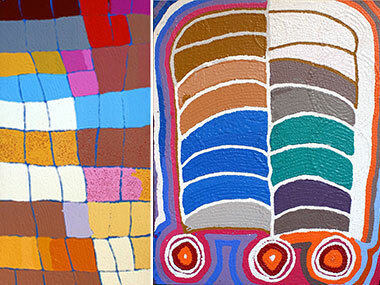 Some of the dealers could have been selling anything - they just happened to sell Aboriginal art. I was taken back by the way some talked about the industry, some had an emotional connection, some didn't." She knew she could do better - even artworks by young, emerging artists she would ensure the best lighting and representation. As her Sydney gallery grew, auction houses started arriving to see what artworks she had on her walls. She was also attracting visitors to Australia, in part because a French tourist guidebook listed her gallery as one of Sydney's go-to spots. Ann then met and married her Aboriginal artist husband, and was invited to become an Australia Day Ambassador on account of her contribution to Aboriginal arts and culture in Sydney - she explains, "It's an ongoing invitation to speak with people about what Australia means to me." She also participated in the Aboriginal Benefits Foundation, a small but influential group chaired by Jennifer Isaacs AM, which raises money to help Indigenous communities with art, health and cultural projects (it has even contributed to the building of healing centre). Ann saw a small window of opportunity open though; being only a few weeks pregnant, she told her husband she needed to "sow some seeds to get to the next place in her career" and that that time was "was now or never". She wouldn't have a destination gallery but was going to find a home for her collection, a place where it would be valued and treated as culturally important - and her focus was international. In the Spring of 2012, Ann flew into the US with a roll of 30 "really interesting, diverse artworks," and the catalogue of that collection. Landing in New York she first visited some family friends and then headed to her accommodation in Brooklyn, where she was warned not to go down streets which were "sketchy" (dangerous). Ann says she was unable to differentiate between the sketchy streets and the safe ones, but after hearing a gun being fired by one of the local street gangs on the night she arrived, she was permanently on guard and after ten days in New York had made it out unscathed. Her next stop was to Seattle where she secured a meeting with the curator of the Seattle Art Museum (SAM), which at the time had a room dedicated to Aboriginal art (you can read Jeremy Eccles review of the Kaplan/Levi exhibition at SAM here). 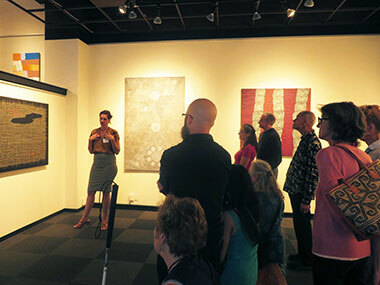 Over lunch, Ann heard about the reaction to that show, "Seattle...were really mesmerised by Aboriginal art, and there were some quite odd pieces on display, like a tall narrow piece by Ronnie Tjampitjimpa which had so much energy coming from it." Yet despite the positive reaction, finding a venue in the US which welcomed a cultural exchange was still rare and she was repeatedly being told, "This art is exotic, we only do local American artists." Her hopes had been raised when the owner of Seattle’s ArtXchange Gallery asked to keep a copy of Ann's catalogue but no promises had been made, and again, Ann left that meeting unsure if anything would come of it. In San Francisco, she met with an art consultant who purchased from her a $4000 artwork to show his client. And a local artist invited her to a multi-storey art facility with galleries and artist studios on every floor (Australia has a similar concept in Sydney called The Depot Gallery). "It was a big night out," says Ann, "San Francisco has a really dynamic art scene." There was also an artist community she visited, located an hour out of town. To get there Ann found herself walking through a ghetto and experiencing that same discomfort she had had while traversing those safe and sketchy streets of Brooklyn. Regretting having dressed up, she took out her pearl earrings as she walked alongside the burnt out cars, bracing herself in case she needed to run. 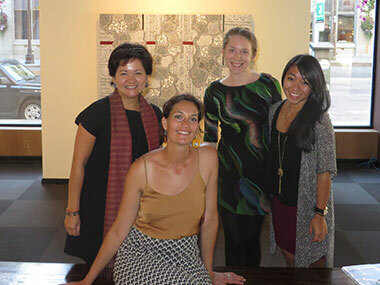 It was a year after she returned to Australia that Seattle’s ArtXchange became the temporary home to Ann’s collection. The exhibition called, Mythscapes - Modern Art from the World's Oldest Continuing Culture , opened with her small family in attendance, and her public talk and slideshow attracted a "very beautiful and appreciative crowd." There are still some works from Ann's collection at ArtXchange, sometimes these are incorporated into group shows, and they are also being promoted through the Seattle Art Fair. Ann says she will “start to increase her trips out bush now that her youngest is out of 'baby age'”. We see a shift in her eyes, she has her sights on another cultural destination now - and this time it's Paris.